PokerStars is the top poker room online and has been since they opened their doors in 2000. The company was the first to offer most of the features that we as players now accept as standard services like statistics and multi-table tournaments. They provide players with the largest selection in tournaments and ring games, as well as qualifiers and satellites to the world’s largest events in poker. The company has received numerous awards over the years including the “2006 Top Poker Site” award from Gambling Online Magazine, which was voted on by the players. They are backed by years of experience in the industry and are regulated by the Kahnawake Gaming Commission, and members of the IGC. If this wasn’t enough the company is also a main sponsor for the European Poker Tour and Asian Pacific Poker Tour. Poker Stars is available in 14 different languages with multiple currency options available. PokerStars.com offers a 100% match up to $600 sign up bonus (Use Poker Stars Bonus Code: PHG125) with an occasional reload offer during special events. The competition varies depending on where you are playing. If you are a low limit player and prefer low stakes poker than the ring games will of course offer a higher degree of loose players. Whereas the higher the stake the more competitive your opposition will likely be. This is one of the things that has attracted people to the PokerStars network. The competition at this room is spread out over every type of player and all skill levels that you just can’t say the room is loose or the room is stiff because in the end Poker Stars fits all player definitions. Poker Stars ring games are available in a wide selection above your typical varieties. Poker Stars currently supports Texas Holdem, Omaha, Omaha hi lo, 7 Card Stud, 7 Card Stud Hi Lo, 5 Card, 2-7 Triple Lowball, HORSE, Badugi, and Razz with the lowest stakes available at 0.01/0.02 NL for beginners who want to enjoy playing with real money without the risk. The highest real money ring game starts at $100/$200 NL or $1000/$2000 Limit. These stakes are very competitive and you may find a pro member of the Team Poker Stars sitting at these tables. The other variations like HORSE and 2-7 Tripe Lowball will have enough traffic throughout the day to stay active. No matter what game you decide to play or what time of the day you log-on there will always be enough players to keep these tables busy, which is one of the strongest features of PokerStars. Tournaments at PokerStars.com are scheduled non-stop with every supported ring game available for tournament play. On average the room can see over 110,000 real money tournament players which means the games will be well populated. The buy-ins start as small as $1 and can easily climb as high as a couple thousand. They offers a tournament leader board awarding the winner each week a heads up match with a pro player like Chris the Moneymaker, satellites to win seats for live events as well as company endorsed poker tournaments like the WCOOP. Qualifiers are literally scheduled around the clock as well as guaranteed tournaments. The Sunday Million is the largest weekly guaranteed tournament that Pokerstars.com offers and is the biggest game you will find anywhere. This game guarantees a weekly $1 million prize pool and is one of Poker Stars main attractions. Normally one would expect to see an overlay with such a huge prize pool offered. In fact it’s the exact opposite and this $1 Million tournament can easily exceed the $2 million mark. Sit N Go’s are no different than the rest of the poker room with a great line up and variety. Just like your tournament selection, SNGs are available in every format however you will need to be playing in the medium staked games to find some Razz or HORSE. SNG’s are available in heads up, heads up shootouts which consist of 4-52 players, 6 player tables, 9 player tables, multi-table Sit-N-Go where you can play with 18 players up to 180. Players can also select between a standard with 10 min blind levels to turbos. This is the widest range of mini tournaments available for SNG players and you will never have to wait long a game to begin. The PokerStars.com software is excellent. Considering the room can have over 100,000 real money players online at any given time they have always remained consistent in the stability of the software. The software is always updated with downtime being almost non-existent as the download is very fast. 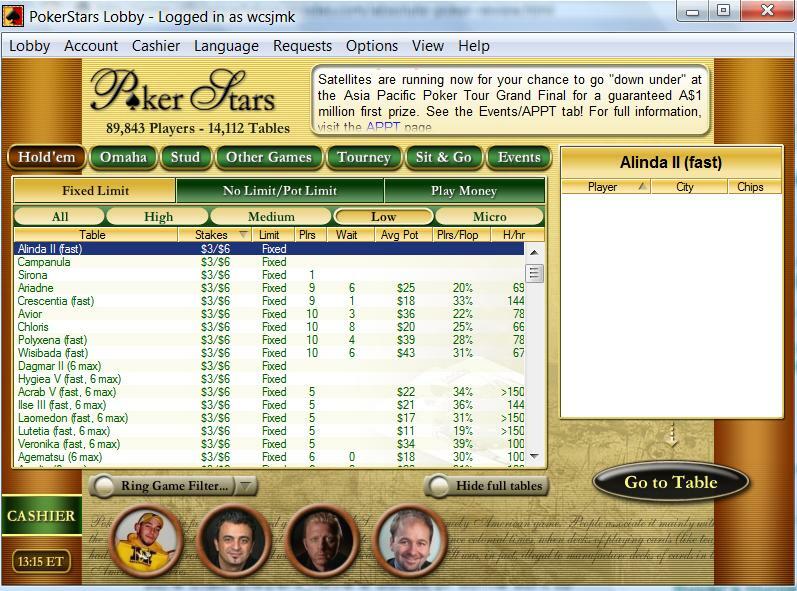 The graphics are clear and smooth and almost every part of Poker Stars is fully customized by the players. You can select your own avatar and background for the poker room which can either be uploaded from your personal computer or chosen from one of a dozen uniquely designed backgrounds. Multi table play allows up to eight tables at once for ring games or an unlimited number of tournaments. One thing I do like is how easy it is to re-size the screen view without interruptions to your game, or you can choose to use the cascading screens. Overall it’s very easy to multi-table with no technical issues. The lobby is designed to allow game selections to be quick and enables an automatic filter. Each of the games is categorized in their own tabs, and provides your statistical data within clear view. PokerStars supports great stats for players both in lobby view and at the tables with pre-flop percentages and average hands per hour. You can also request for your own ring game and tournament information to be emailed to you. As of September 2008, PokerStars now offers a downloadable Mac poker client for their popular software. Previous to this Mac release, players had to use a PC simulator on their Macintosh in order to play at PokerStars. This is great news for Mac poker players and should increase the number of players at the World’s Largest Poker Room. One of the most important things that players should look for when choosing a room is player support and financial security. PokerStars is a fully licensed and regulated poker room Isle of Man, in the British Isles, and since their initial launch they have held an outstanding reputation for financial security and fair gaming. Support is available around the clock through email only. What is impressive is Poker Stars is a massive room but they have continued since day one to emphasize that players receive quality support when needed. This is evident through the quick response time the room delivers. Players should receive a reply back from a support staff within 10-15 minutes which is very quick considering the size of the room. The staff is very friendly and I have never had a bad experience from the team at Poker Stars.